as you may have noticed from my instagramstories, i started cooking school! it’s hard to believe i went from someone who barely knew how to cook beyond beans, rice and eggs to now making something most nights of the week, hosts and cooks thanksgiving dinner and loves doing it! 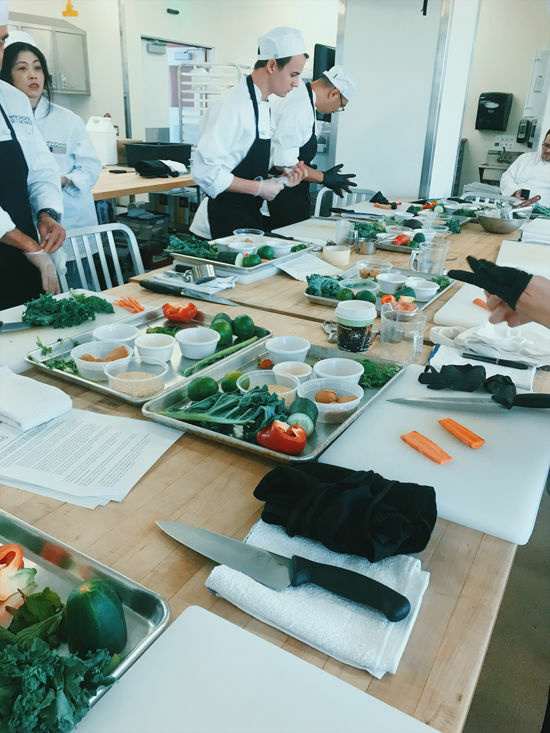 here’s a peek into the class, and i have to admit it did feel like i was on the show Chopped for the first few weeks haha. 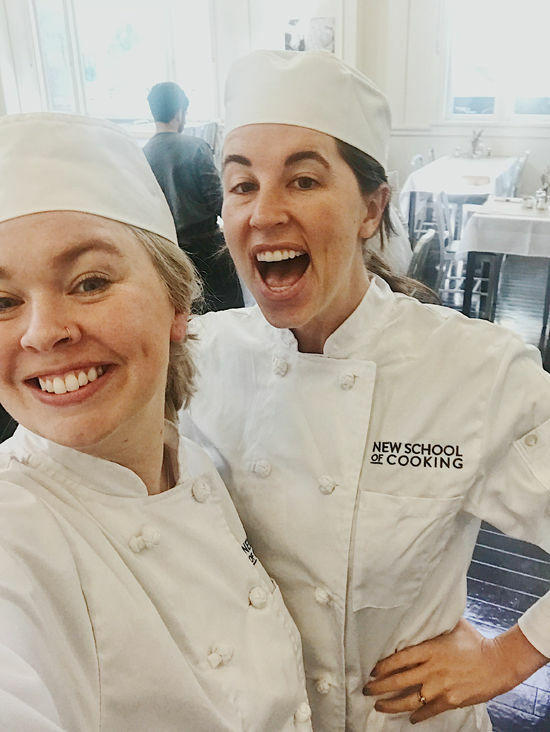 about 6 months ago i had the strong desire to take my skills to the next level and started investigating what it would look like to attend some type of culinary program. i wanted something that wasn’t too intense and would allow me to still work as normal but that wasn’t just recreational and had some intensity to it. for me, it’s important for there to be a note of seriousness to the classes i’m taking because if i’m going to commit the time, i want it to be worth it. and that’s when i landed on the New School of Cooking in Pasadena. 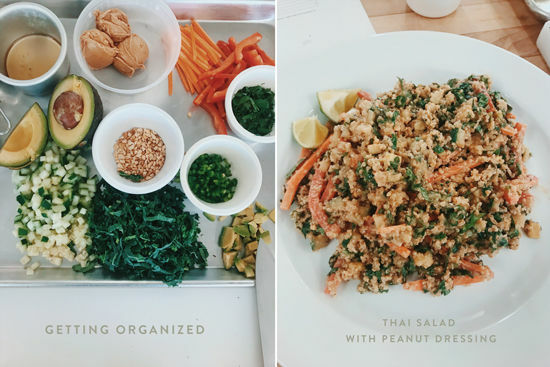 they offer all types of classes, from certificate programs to one time classes for date nights but what caught my eye was their cooking series, it’s designed for people like me who have foundational knowledge cooking but want to build my skills with hands on guided lessons. and they provide everything, the uniform (yes, we wear chef coats and hats!) and all the tools and food we need each week. it makes it really simple for me to commit when all i have to do is show up. joanie and i were both so nervous to start, like first day of school nervous. it felt a little scary but also nice to be pushing myself outside my comfort zone. it’s odd to think that we go from being kids and always learning and being in classes and programs and we sort of loss that adaptability as adults. continuing education is something i’m really starting to see the value in. we’re currently in our 8th week of classes and it’s been such a blast. sometimes it can be a little overwhelming, but in a good way. i can feel myself growing. our schedule the past couple of months has been nuts and coming to this class weekly is a great way to unwind and really put my focus on something specific for 4 hours. our teacher is really sweet and passionate about the history of everything so i really feel like we’re learning not only skills but facts about dishes and locations. we can make up class on saturday if we have to miss monday and it’s actually kinda cool to get different teacher’s perspectives. the whole series is working towards giving you the skills to be able to recreate dishes on your own and not necessarily needing a recipe. building CONFIDENCE! each week has a theme, say it’s eggs and we’ll have a lecture talking about eggs, different ways to prepare them, serve them, use them, etc. and then the chef will demonstrate a recipe and then we’re off to try it on our own. the hands on part is super important because that’s how it really sticks in my brain. 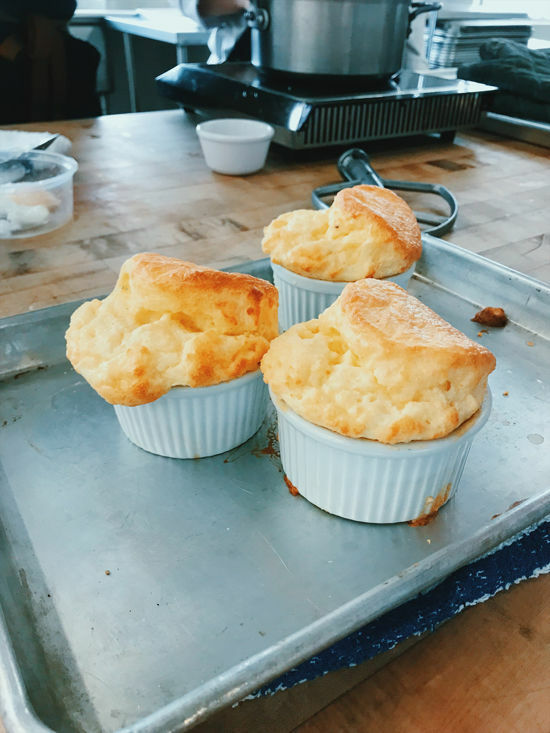 in a class like eggs we’re covering a lot of ground, so we learned about roux and made egg and cheese soufflé with it and then turned the roux into béchamel by adding milk and made mac + cheese and we also made french omelettes and eggs benedict with hollandaise sauce from scratch (talk about an arm workout!). it ends up being a really full four hours with a lot of information and learning. but it’s also really fun. 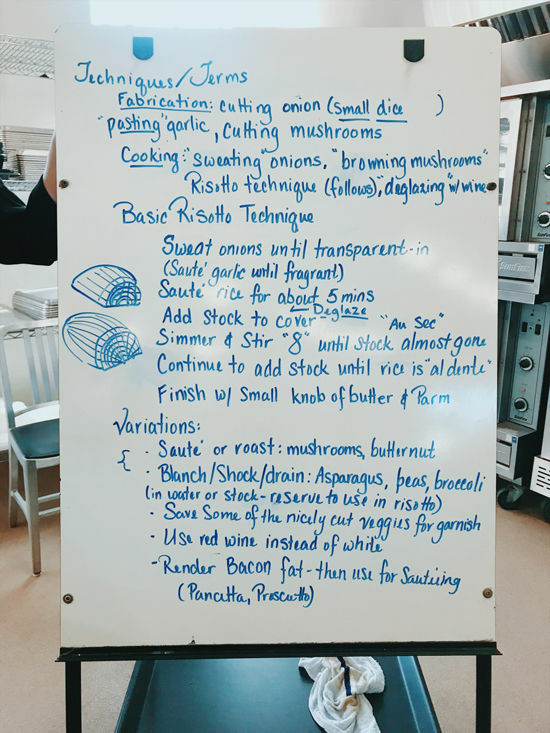 i thought it would be fun to show you a little bit of what we have learned (and we have more recipes to show you down the line too! we made a green curry that was SO good) i’ve been working on perfecting my french omelette ever since we properly learned in class. i have a feeling it’s one of those things you work on for quite some time until it becomes natural, but it’s so worth it! the result is delicate and amazing and makes you feel PRO. and as we have learned in class, there is always going to be many ways to do anything with cooking, everyone does things a little differently. and that’s the beauty of cooking, find what works for you, experiment, and have fun! • the main tip is to cook your eggs on VERY LOW HEAT. i’ve been making my soft scrambles this way for a while now and they are so perfect, i will never go back to cooking eggs on higher heat. you don’t want to put color/burn your eggs. to keep them fluffy and light you need to cook them low and slow and constantly move them around if you are making it scrambled. it takes a few extra minutes, but again, worth it. • using clarified butter is recommended so it won’t burn. clarifying butter just means you cook and remove the milk solids which is the part that will burn. i still use regular butter at home but it’s a good tip. 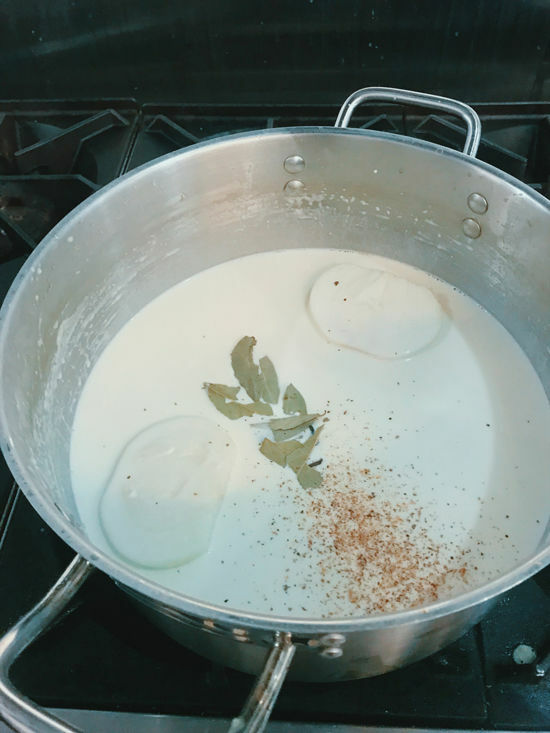 • you can use a fine mesh sieve to strain the egg which removes the albumen (that’s the white stringy part that doesn’t mix in well with the eggs). this is an optional step but it only takes a second and ensures you’ll have a smooth color and texture. • definitely use a non-stick pan for eggs. 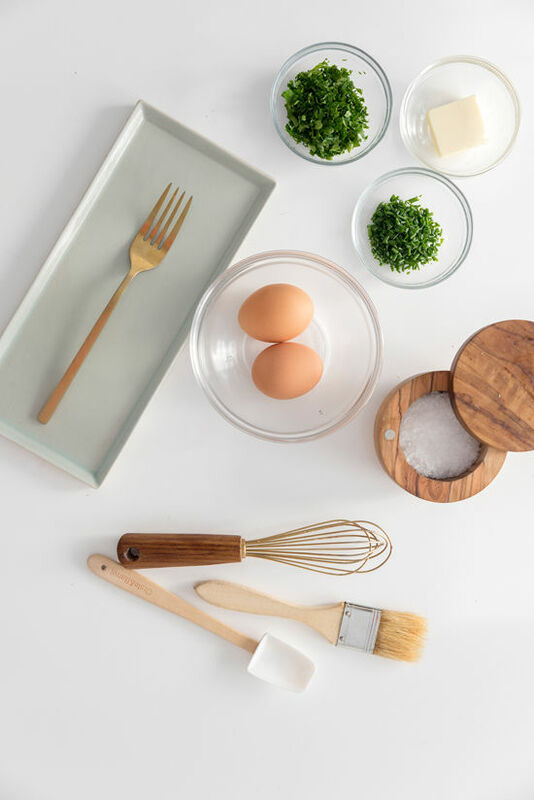 • remember that your eggs will continue to cook after you take them off the heat so remove them a few seconds before you think they are ready and plate them right away! 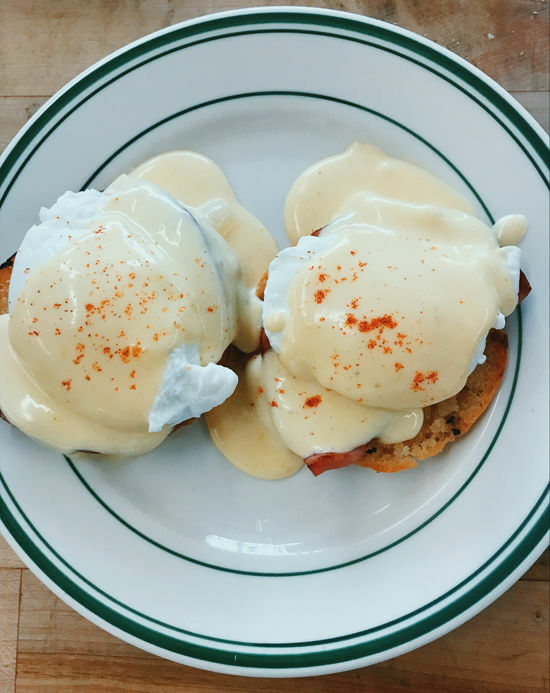 if you’re into eggs, this is a fun read. everyone has their own tricks! 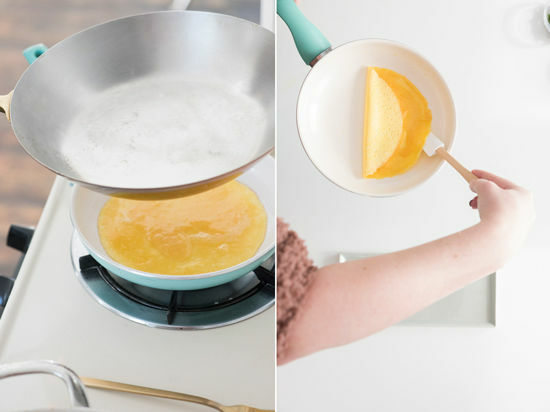 • heat up the butter and once it’s totally melted and you see small bubbles you add the eggs to the pan and turn the heat all the way down. • you can use a rubber whisk or a fork if you are careful. i just use the fork on the top and whisk the eggs around to keep them really fluffy and cooking evenly when i pour them in the pan. just don’t touch the fork to the nonstick pan, you don’t want to scratch it at all because the teflon is bad for you! • i use a rubber spatula to make sure to keep the eggs from getting too cooked on the edges, so continue to lift up the sides. you don’t want it to get too thin and cook faster on the outside. • remember this is a practice in PATIENCE, which i know i need more of in my life! • now! we tried two different techniques. one is to turn the heat all the way off and keep the pan on the burner and put a plate (or i think a skillet is easier to handle) on top so that the eggs steam for a few minutes and don’t cook too much on the bottom. this way works well but takes a little more attention to it. or you can put your oven on low and as soon as you start to see the sides of the eggs cooking a little bit (maybe 2 mins) you can pop the pan in the oven at 275 degrees for 4 minutes or until the egg is cooked but not overcooked! • folding it might be the hardest part and i am still working on it myself! usually i fold over one side to the middle line. 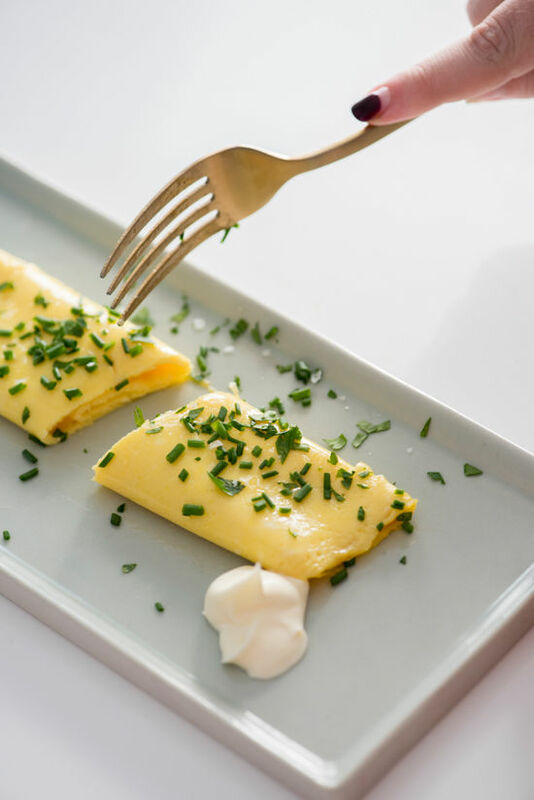 then i slide the egg onto the plate from the opposite side and let the omelette fold over onto itself, making a perfect tri-fold. practice makes perfect. 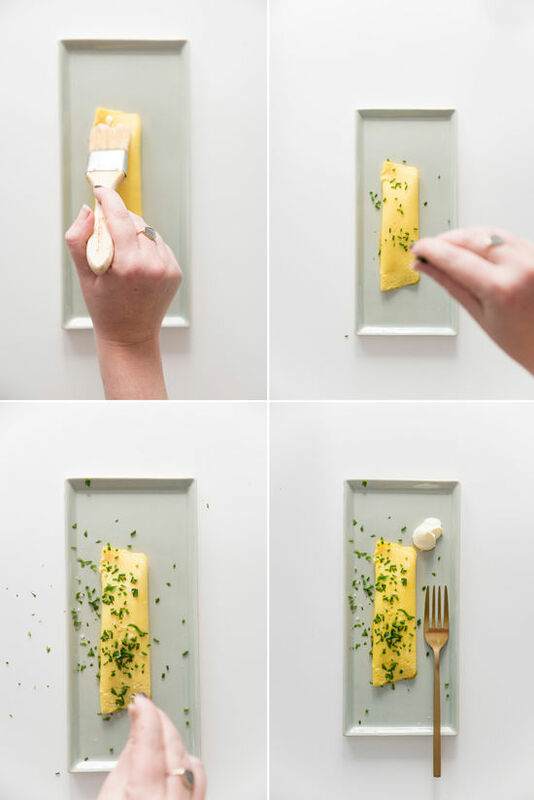 • brush with butter to give it that pretty shine on the plate. • garnish with chives or parsley or both and some flaky salt! the texture is so perfect and light it tastes almost like there is cheese inside. 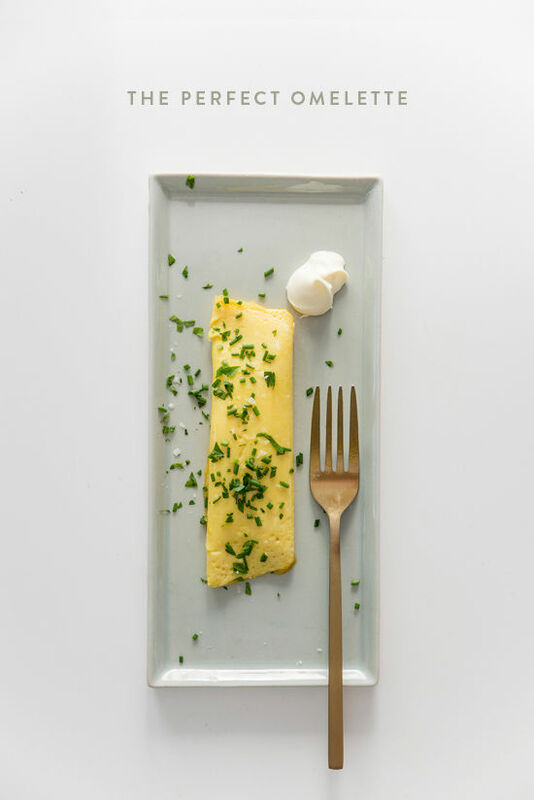 no more brown, textured, dry omelettes! and the effort is only an extra couple of minutes. hope you try it at home! That’s all I’ve got. Teach us!!!! YES thank you for sharing!! Will definitely be attempting this weekend. ps I love your tone of writing – it feels like a conversation 🙂 good luck with the rest of classes, can’t wait to see the rest of your progress! Wow! It sounds so amazing!! Thank you for sharing! Afternoon where is this school.